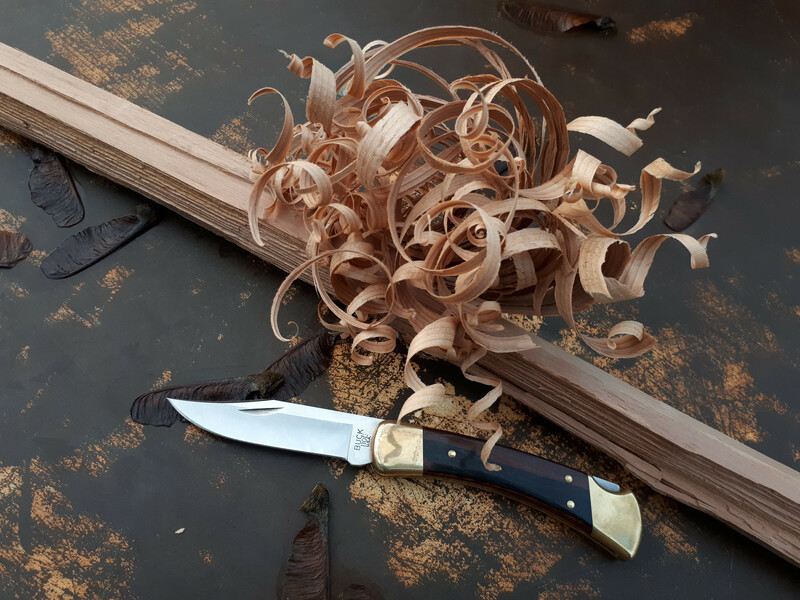 Discussion in 'EXPAT Knives®' started by Expat, Oct 24, 2016. I managed to track one of these down at a Vancouver gun shop, and at a reasonable price. Serial # 001/250! Should have it in-hand next week! Bushman5, STPNWLF and IW17 like this. Zeek, Strigidae, The Marsh Gorilla and 1 other person like this. Strigidae, Mike Smith and Zeek like this. Mike Smith, IW17 and Zeek like this. Just came across this again after reading it a few years ago. Bushman5, STPNWLF and Bluelew like this. Anyone have the Buck Brahma? Thoughts? Not a fan of the way the pommel is secured from spinning (with a pin into the leather). Big fan of the 119 in general though, and it's available in a number of custom versions on Copper and Clad (including in 5160, S30V), though, I'm just fine with their standard stuff. I'd really like to pick up one of those re-introduced USA made flap sheaths (Vietnam style). what if i used red loctite on the pommel nut threads? Its not like i use the pommel for hammering....except for my knives with glass breaker pommels...they are a blast to break windows at the scrap yard. guy locally selling one.....trying to get down on price......its used a bit and he wants W&W price for it. I don't think you'd have any issues with the pommel nut at all. Edited due to a copyright I didn't see.... part 2. 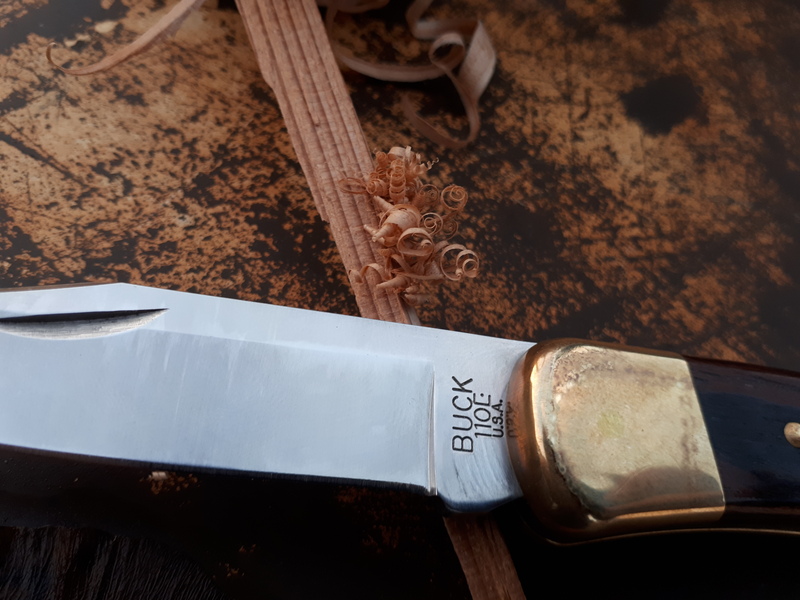 ^ Hey @olywa, has Buck finally gone back to using the loop style belt loops on the 110 sheaths, or are they still just a flat band of leather? I haven't had the opportunity to check out one of the newer ones (post 2018). 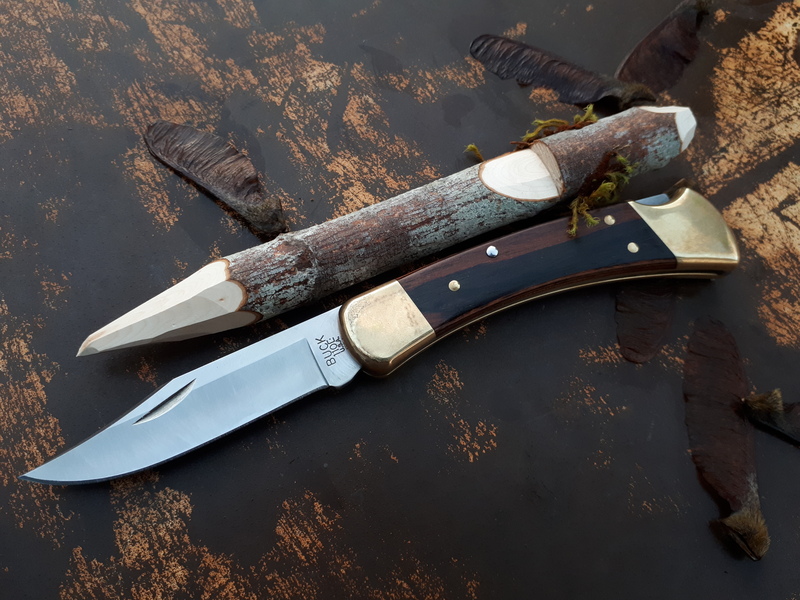 Decided to put my 110 through some basic woods tests tonight, and for a folder, it did pretty damn well. 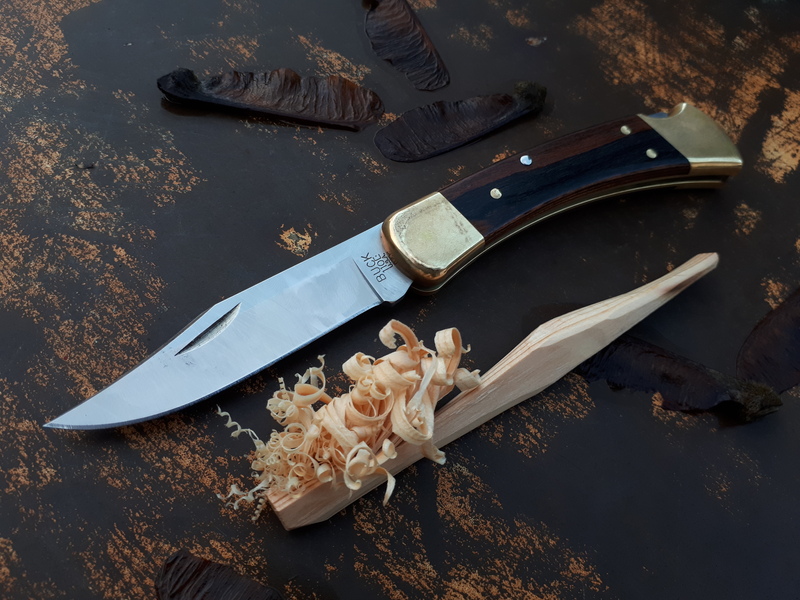 First made a small feather on some dry Fir, which is what I'd normally knock out to start any average fire, be it with a ferro rod, lighter or matches. Just something to take that initial flame/spark. Then I figured I'd see how it does at making something bigger, so I grabbed a chunk of Red Cedar drift I harvested a few years back. This split is from a small log, about 5' long, 14" wide. It worked just fine, albeit a tad uncomfortable at times. Due to the handle lacking a bit of thickness I'm normally used to, my middle finger began digging into my palm pretty good. But honestly, other than that, it did really well. Also does great with small stuff. And finally I just knocked out a simple stake out of some dry Maple. Worked just fine. 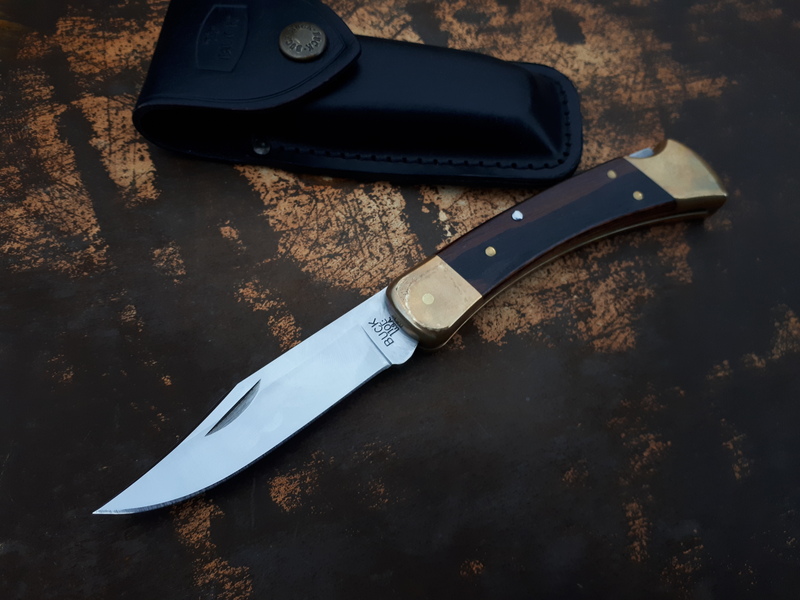 I've always been a fan of Buck's 420HC, and I've used it for years now. But something I feel the need to mention is the ease of which you can get the edge back. It would still cleanly slice paper after use with no flat spots, rolls, etc, but 15 seconds on a strop and it shaved effortlessly again. There's definitely something to be said for steels which are easy to sharpen after use. Nice looking 2015 , 110 Reno. Thanks, I'm rather fond of it. Mike Smith, Bushman5 and STPNWLF like this. Has anybody picked up one of the new 110's with real ebony scales yet? I fully intend to snag one as soon as I can. No, not yet .But some of the guys on the Buck forum have and they say they are happy with them.